Fresh meat starts 24/2/13! + free preview session! Newcastle Roller Girls’ fourth official newbie intake gets under way on Sunday February 24th 2013 at the newly refurbished Walker Activity Dome, Wharrier Street, Walker, Newcastle, NE6 3BR. The sessions will run every Sunday morning for a period of 15 weeks, from 1030-1230 and will cost £5/session. 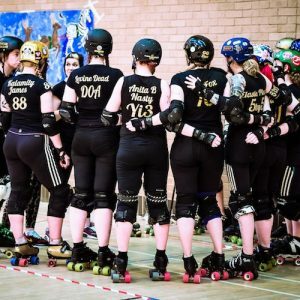 Our new skaters will be put through a specially tailored roller derby training course, at the end of which the participants will have passed the Women’s Flat Track Derby Association’s minimum skills and will be ready to progress to intermediate sessions within the wider Newcastle Roller Girls league (including Tyne & Fear). THIS TRAINING COURSE IS FOR PEOPLE WHO CAN ALREADY STAND UP AND MOVE ON SKATES, we will not be teaching how to skate from absolute scratch. You don’t have to be a whizz by any means but if you can’t stand up or move around without holding on to the walls, we recommend heading to the roller discos (details below) and spending quality time on 8 wheels to get you ready for the *next* intake. Due to the full contact aspect of roller derby, we cannot accept skaters under the age of 18. We recommend that skaters under the age of 21 (and anyone who looks particularly youthful!) bring proof of age (driving licence, passport etc.) If you have any longstanding illnesses or injuries, you’ll need to show us a note from your doctor before we will let you skate. Roller derby is amazing fun, even better than it looks, but it’s a huge challenge for all levels of skater so be prepared to work hard; you’ll only get out of it what you put in after all. The course requires your time and commitment for the safety of yourself, your fellow trainees, and us! Therefore IF YOU MISS MORE THAN 3 OF THE INITIAL 15 SESSIONS YOU WILL BE ASKED TO RETURN FOR THE NEXT INTAKE later in the year. Weeks 1-5: skating basics – stops, starts, falls, being safe. Weeks 6-10: derby specific skills – laterals, jumps, crossovers & more! Weeks 11-15: more derby specific skills – speed laps, hitting, whips & more! You will be tested on the skills you’re learning every five weeks, if you fail a test you will NOT be able to continue with the training sessions this time around but can try again next time. If this is your second intake and you fail again, we’ll ask you to take some time away and work on your skating before you can return at the intake AFTER the next one. Don’t worry if you don’t have any kit yet, we have stuff you can borrow BUT IT IS EXTREMELY LIMITED, ESPECIALLY SKATES. Some sizes we only have a couple of pairs, some none at all (if you have unusually small or large feet please email us to check for availability but even then we can’t promise them to you if someone who also needs them turns up first). Where possible please bring your own skates or borrow from your mates. Roller derby requires skaters to wear a helmet, wrist guards, elbow pads, knee pads, a mouth guard/gum shield and quad roller skates. All kit that we do have can be hired on a STRICTLY first-come-first-served basis for £1.50/session. You will be expected to invest on your own kit over the course of the intake – believe us, you will want it! we cannot guarantee to loan you skates in your size and IF YOU DO NOT GET ON SKATES (hired from us, borrowed, your own or otherwise) BY THE SECOND SESSION AT THE LATEST you will not be able to continue with the course. Our league is co-ed, meaning these sessions are open to both men and women. This means you will be training with members of both genders! Have you seen the poster for our fresh meat intake on Sunday February 24th, but aren’t quite sure what roller derby is all about ? 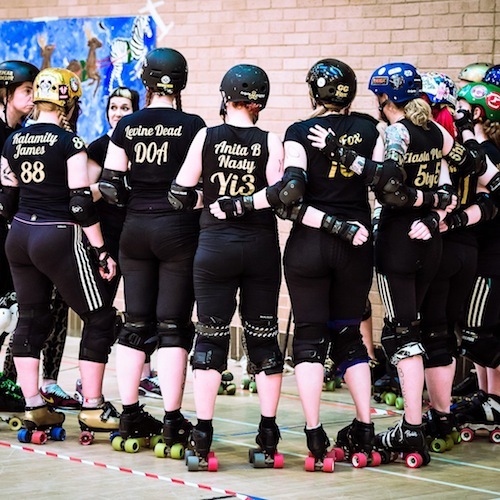 Newcastle Roller Girls, including our men’s team Tyne and Fear, are throwing open the doors to their practice the week before on Sunday February 17th for potential skaters like you to see what it’s all about! Our newbie co-ordinator Big Smack and Fries will meet & greet you in the foyer of the newly refurbished Walker Activity Dome, (Wharrier Street, Walker, Newcastle, NE6 3BR) between 1pm and half past then take you upstairs to the viewing balcony, where you can watch the womens’ and mens’ teams playing roller derby in what we call a scrimmage. She’ll be on hand for the full two hours to answer any of your questions and explain the game. Make sure you join both events on Facebook to be kept up to date, and we’re SO excited to finally meet you all! Previous Post2013’s first fresh meat intake is coming soon!Next PostMad Smacks. NRG’s First home bout of the year!